Here you'll find information and resources for keeping your dog safe and happy while having fun together. Pet Owners: Learn to Keep Your Dog Safe! Dogs that have appropriate outlets for their energy are usually happier, healthier, better socialized, and better mannered dogs. Dog parks have become a popular way for owners to exercise their pets. However, for some dogs, dog parks are not all fun and games. Here are some of The Dog Gurus’ tips for owners who want to make sure their dogs don’t get hurt, seriously injured, or even killed in an off-leash dog park where there are usually no knowledgeable or trained pet professionals supervising the play. Is it right for your dog? The average age of the dog that enjoys a good romp with a group of other dogs is 6 months to 3 years of age. Puppies from 3-6 months can definitely benefit, but they can also be more easily traumatized if not put in the right group. If your dog chooses to avoid other dogs, then an off-leash play setting may not be the best outlet for your dog. Dogs that enjoy off-leash dog play usually actively seek out the attention of other dogs. Remember, it’s not about the dog, it’s about the environment. If your dog doesn’t enjoy off-leash dog play, that doesn’t make him a bad dog. It merely means he’s a dog that would rather participate in some other activity. What is socialization? 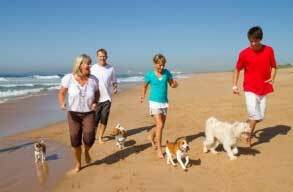 Many people take their dog to off-leash play sessions so they can socialize their dog. This is a great idea, but remember that socialization is not just about exposure to any and all things in the world. 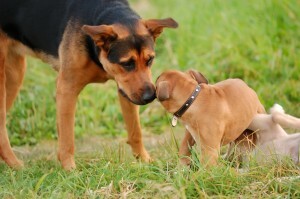 Socialization means positive interactions are created to help a dog grow, play, and learn. It should not be a random encounter with just any dog or person available. A bad experience, especially for a puppy under 5 months of age, can have lifelong implications. Controlling your dog. Off-leash dog play should not be a free for all. Dogs do best if they have been taught some basic skills. You should be able to get your dog’s attention and call him to you even if he’s off leash playing with another dog. This will give you a good measure of control when he begins to get too rowdy. Dog play…the good, the bad, and the ugly. Not all dogs play nicely. Some dogs play well, but only with certain playmates. Just as with children, you must choose your dog’s playmates wisely. Educate yourself to learn the difference between play styles and make the best match for your dog. Remember to separate dogs by size and by play style. Small dogs should never be placed with very large dogs—even if they play well together. 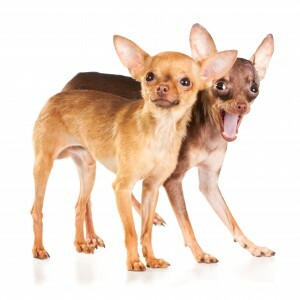 Small dogs can create a predatory behavior in some larger dogs, which can become deadly very quickly. Play styles vary. 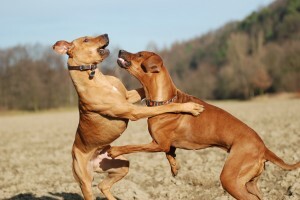 Some dogs love to chase one another; others love to wrestle and play bite; others like to play gently using their paws like kittens; still others like to body-slam one another. Put your dog with dogs that have similar play styles. If your dog is gentle, she will not enjoy playing with a dog who body-slams her. Both play styles are appropriate, they just aren’t appropriate together. Too much arousal can lead to aggression. Dogs need rest periods and breaks even when they are playing. Teach your dog to come to you periodically and don’t allow the dogs to become overly rowdy in their play. It looks like fun, but can seep into aggression very quickly. If the dogs don’t slow themselves down occasionally during play, you need to do it for them by calling them to you and giving them a short 30-second break. Don’t allow play to go uninterrupted for more than 2-3 minutes at a time. Introducing dogs to each other. Always introduce your dog one on one and go at the dog’s pace. Allow the sniffing to occur since it is a necessarily part of the greeting ritual. Don’t force a dog to greet another dog if either dog is showing avoidance. When you show up at a playgroup, have the other dogs move away from the gate before you enter. If owners aren’t there to move their dogs away, just wait until the dogs get bored and go away on their own. Then bring your dog in when things are more settled. Watch for any signs of stiffness or nervousness. Supervision is the key, but you have to know what you are looking for. Happy dogs have loose, curved bodies. They play with exaggerated, repetitive, lateral movements. Their bodies remain fluid and loose during play. They play taking turns (one dog pins another, then they switch roles). They also take periodic breaks. Nervous or tense dogs are still and rigid. They play with precise movements that are quick and tight. They don’t take turns (one dog always seems to pin the other and keep him pinned too long). Look for common signs of stress to see if any dog is becoming overwhelmed. Recognizing stress signals. Here are some common stress signals in dogs. If your dog starts to show combinations of these at one time, he’s probably becoming overwhelmed. Lip licking is an easy-to-recognize signal that occurs when a dog flicks his tongue in and out of his mouth. Yawning is not usually a sign of contentment as much as it is a sign of nervousness. Half-moon eye is when you see the whites of the dog’s eye around the outer edge of the eye. If your dog is repeatedly clawing and/or jumping on you in a panic-stricken sort of way, he’s asking for help. Don’t make him “just deal with things.” You need to assess the environment to see why the dog is so frightened. Be your dog’s advocate. Don’t be afraid to remove your dog from a group if the play seems inappropriate. Ask questions and ensure those supervising the dogs have experience. Not all play is good for all dogs and it’s up to you to make sure your dog is having a good time and learning good behaviors.